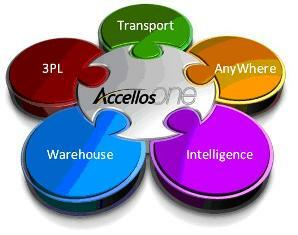 Accellos Inc. – is software developer for logistics known world wide. Twenty years of experience and over 3000 satisfied clients in 21 country let us safely say, that Accellos One is fitting every clients needs. Logistikai skirta programinė įranga turi būti tarpusavyje suderinama ir pasirenkama pagal poreikį – tai pagrindinis principas, kurio laikosi kompanija Accellos, kurdama programų rinkinį Accellos suite. Ar tai būtų sandėlio valdymo sistema, ar transporto optimizavimo, ar verslo informacijos apdorojimo (bussiness intelligence) – tai turi būti kuriama vienoje programavimo platformoje. Todėl įsigijus sandėlio valdymo sistemą, pagal poreikį prie jos lengvai galima priderinti transporto krovinių bei maršrutų optimizavimo sistemą ir t.t. For more information please contact: info@dsprojektai.lt. Manage Edition is built for the organization that is looking for a limited amount of system direction but plans for growth. Fulfill Edition is designed for the more sophisticated user that needs more control, automation and flexibility in their warehouse. 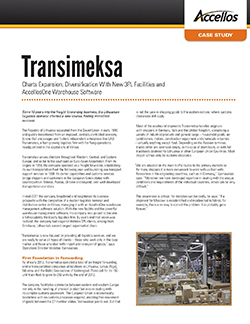 UAB "Transimeksa" has already successfully instegrated Accellos One Warehouse warehouse management system in their 12500m2 warehouse. 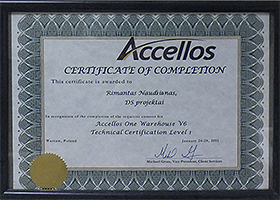 Find out more about ir in the Accellos case study or in Verslo Žinios article: "UAB „Transimeksa“ atidaro naują logistikos centrą Vilniuje"
For more information, system demonstration or purchase details please contact:info@dsprojektai.lt. Both alone and with Accellos One WMS or one of the other systems from Accellos One series, Accellso One Optimize is a powerful tool for optimizing goods delivery and reducing total operating costs. 3PL warehouse. 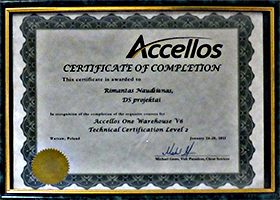 Since a warehouse, designed for 3PL logistics, requires more and different functions and possibilities than manufacturing of retail warehouse, Accellos decided to create a separate product specifically designed for 3PL warehouse. For example, effectively handling multiclient billing and workflow isn’t an afterthought – it is an intrinsic part of the system from the design of the data forward. Transport management. The market is converging. Third party logistics (3PL) companies are acquiring power units and becoming trucking companies. Traditional freight carriers are leasing warehouse space and getting into the 3PL business. And, freight consolidators are brokering freight at an ever increasing rate. It’s no longer enough to offer solutions that deal with one business model. Today’s transportation management system must be adaptable to the needs of Carriers, Brokers, Shippers, and Advanced Logistics Providers. And, be capable of seamlessly integrating with leading warehousing systems. Accellos One Transport is all of that and more. Accellos One PulseTM enables 3PL’s, distributors, retailers, manufacturers and transportation companies to get "live" insight into the key performance indicators that drive decisions in their business every day. It does not require a huge amount of paper - reports and real procceses are plainly and clearly shown on the computer screen.